Ten days after the last liftoff from historic launch pad 39A in Florida, another SpaceX Falcon 9 rocket ignited its Merlin main engines for several seconds in a hold-down firing Thursday ahead of a planned expendable flight next week with an Inmarsat communications satellite. The two-stage rocket was filled with super-chilled, densified RP-1 kerosene and liquid oxygen propellants in a mock countdown Thursday. 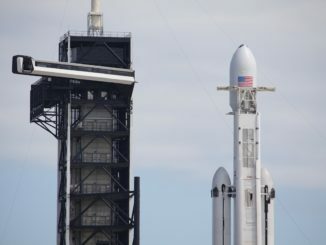 SpaceX engineers monitored the computer-controlled countdown as the rocket’s engines were primed and fuel tanks pressurized for ignition. Nine Merlin 1D engines fired for around three seconds at 1645 GMT (12:45 p.m. EDT) as clamps restrained the launcher at pad 39A. A plume of exhaust rushed out the flame trench to the north of the seaside facility at NASA’s Kennedy Space Center. SpaceX confirmed on Twitter that the customary preflight test, called a static fire, was successfully accomplished. 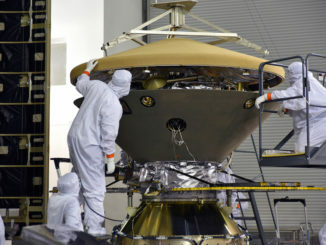 Engineers will look at data on the performance of the engines before convening a launch readiness review ahead of a planned blastoff Monday evening. The next step in the launch campaign will be the removal and rollback of the Falcon 9 rocket to SpaceX’s hangar about a quarter-mile to the south of pad 39A. The structure is built on top of the crawlerway where Saturn 5 moon rockets and space shuttles traveled before climbing into orbit. The Inmarsat 5 F4 satellite, a Boeing-built craft designed to link airplanes and ships via broadband, inside SpaceX’s payload fairing will be rotated on its side and connected with the Falcon 9 inside the hangar this weekend. Owned by London-based Inmarsat, the satellite will join a fleet of three other relay platforms in geostationary orbit providing global broadband connectivity to airliners, business jets, maritime vessels, oil and gas industry users, and military units. Inmarsat ordered the satellite from Boeing in 2014 as a spare for the Global Xpress network. At the time, Inmarsat projected Inmarsat 5 F4 to cost between $220 million and $250 million. 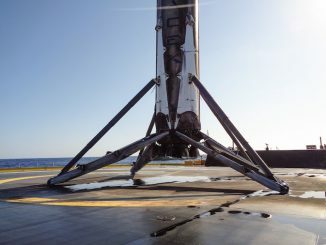 After a check of the mechanical and electrical interfaces between the launcher and the Inmarsat 5 F4 satellite, SpaceX ground crews will transfer the Falcon 9 horizontally back up the ramp to pad 39A on Sunday or early Monday. Hydraulic pistons will hoist the 229-foot-tall (70-meter) rocket vertical for Monday’s countdown. The launch window Monday opens at 7:20 p.m. EDT (2320 GMT) and extends for 50 minutes. The Falcon 9 will head east from the Cape Canaveral spaceport to place the Inmarsat satellite into an elliptical geostationary transfer orbit with reaching tens of thousands of miles above Earth. Inmarsat 5 F4’s on-board thrusters will guide the satellite to a perch in circular orbit around 22,300 miles (35,800 kilometers) over the equator. The upcoming mission will be the sixth SpaceX launch of the year, and the fifth Falcon 9 flight from pad 39A since Feb. 19. It will mark the 99th liftoff from the storied launch complex, which entered service in the Apollo era and hosted the majority of space shuttle launches, including the first and last departures of NASA’s winged spaceships. Monday’s launch will be the 34th flight of a Falcon 9 rocket overall since SpaceX’s commercially-developed booster debuted in June 2010. The most recent Falcon 9 mission lifted off from pad 39A on May 1 with a top secret payload for the National Reconnaissance Office, the U.S. government’s secretive spy satellite agency.